Just after the public release of Apple iOS 6.0.1 Firmware for iPhone 5, iPhone 4S, iPhone 3GS, iPad 4, iPad 3, iPad 2, iPad Mini, iPod 5G Touch and iPod 4G Touch devices now Apple has also released its next and latest iOS 6.1 Beta Firmware Update (Build 10B5095f) for iPhone 5, iPhone 4S, iPhone 3GS, iPad 4, iPad 3, iPad 2, iPad Mini, iPod 5G Touch and iPod 4G Touch iOS Device users as well as for registered iOS Developers worldwide for testing and preparation of next Final Build of iOS 6.1 Firmware for iPhone, iPad and iPod. 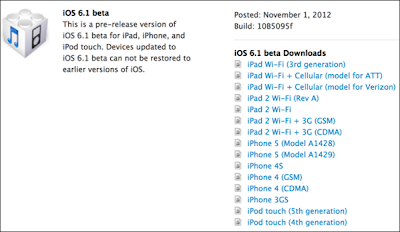 Apple iOS 6.1 Beta Firmware (Build 10B5095f) is now officially available through iOS Dev Center Website for registered Apple iOS Developers and for general public via Direct Download Links of iOS 6.1 Beta IPSW Firmwares for iPhone 5, iPhone 4S, iPhone 3GS, iPad 4, iPad 3, iPad 2, iPad Mini, iPod 5G Touch and iPod 4G Touch. 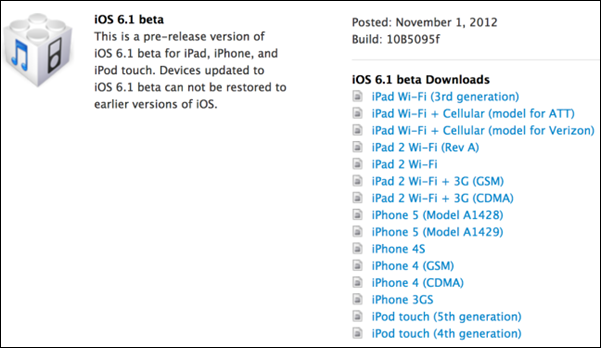 Apple with the release of new iOS 6.1 Beta Firmware has also release the new Xcode 4.6 Beta integrated development environment and the 6.1 iOS SDK beta for iOS Developers through the portal. Download and Install iOS 6.1 Beta IPSW Firmware Software Update for iPhone 5, iPhone 4S, iPhone 3GS, iPad 4, iPad 3, iPad 2, iPad Mini, iPod 5G Touch and iPod 4G Touch for better software improvement on your iDevices. Update: Download and Install Latest Apple's iOS 6.1 Final IPSW Firmwares for iPhone, iPad & iPod Touch Now. Apple iOS 6.1 Beta (Build 10B5095f) Firmware will brings new and enhance improvements in iPhone, iPad and iPod, Apple iOS 6.1 Beta Firmware Change Log includes, obligatory bug fixes, integration of new mapping technologies into Apps, several improvements to handle the new Passbook app as well as some minor unidentified changes to Mobile Safari, inclusion of new API for developers to include the new vector based Apple maps which allow them to search for map-based addresses and points of interest., improvements in Apple’s “Map Kit Searches”, new class of “MKLocalSearch” which will allow map-based content users to enter place name info of an address to return relevant details, integration of a new Reset Advertising Identifier button into Advertising Settings and many other fixes and improvements. If any iOS device user or registered iOS Developer wants to Upgrade iOS 6.0/6.0.1 Firmware to iOS 6.1 Beta (Build 10B5095f) Firmware for iPhone 5, iPhone 4S, iPhone 3GS, iPad 4, iPad 3, iPad 2, iPad Mini, iPod 5G Touch and iPod 4G Touch devices than its possible via iTunes through downloading of official Apple iOS 6.1 Beta (Build 10B5095f) IPSW Firmware files directly from iOS Dev Center Website or via Direct Download Links of iOS 6.1 Beta IPSW Firmwares for iPhone 5, iPhone 4S, iPhone 3GS, iPad 4, iPad 3, iPad 2, iPad Mini, iPod 5G Touch and iPod 4G Touch available below. But before you start the process of download and installation of iOS 6.1 Beta (Build 10B5095f Firmware onto your iOS device, we highly recommended to take backup of your device data first through iTunes. Update: Download and Install Latest Apple's iOS 6.1 Final IPSW Firmwares for iPhone, iPad & iPod Touch Now. Official Apple iOS 6.1 Beta (Build 10B5095f) IPSW Firmware is available through Direct Download Links from following mirrors. iOS 6.1 Beta IPSW Firmware setup files for iPhone 5, iPhone 4S, iPhone 3GS, iPad 4, iPad 3, iPad 2, iPad Mini, iPod 5G Touch and iPod 4G Touch can be install via iTunes software into your respective iPhone, iPad and iPod touch devices. Following Official Direct Download Links of iOS 6.1 Beta IPSW Firmware of iPhone, iPad and iPod is fully activated and in working condition. Note: If any iOS device users don't have his self-registered UDID iOS Developer account than you won't have to worry because you can still Install and Activate iOS 6.1 Beta Firmware on iPhone 5, iPhone 4S, iPhone 3GS, iPad 4, iPad 3, iPad 2, iPad Mini, iPod 5G Touch and iPod 4G Touch devices without having UDID and Registered iOS Developer Account. Click Here and get Tutorial and Guidelines of installing and activating iOS 6.1 beta firmware without having UDID and iOS Developer Account. Enjoy!